The Federal Government has added wood dust to its list of known human carcinogens and old wood varnishes can contain as much lead as old paint! If necessary precautions are not taken and adequate dust collection is not used, this toxic dust can linger for months on surfaces in your home. Every time this dust gets stirred up, you and your family are re-exposed to these dangers. Unlike a bag collector, Oneida’s patented, new technology can eliminate up to 99% of the airborne dust created from floor sanding operations. That means that we are protecting your health and property. 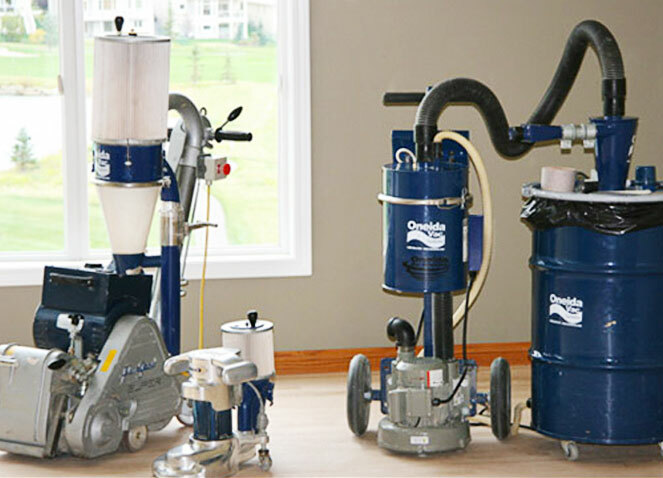 Besides the obvious health benefits, anyone who has experienced the nightmare of trying to clean up wood dust caused by having your floors sanded will doubly appreciate the virtually dust-free sanding we offer by using the Oneida Vac System.